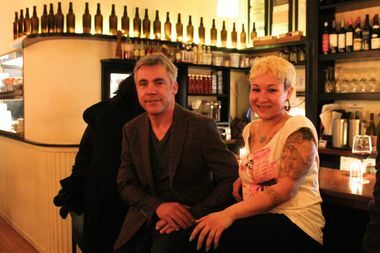 Cyril Burke and Eve Gagnon of Jack & Nellie's teamed up to open a new restaurant on Austin Street. QUEENS — A new restaurant and bar serving eclectic cuisine and local beers is coming to Austin Street this summer, the owners said. The eatery, called Rove, is slated to open at 72-27 Austin St. sometime in August, replacing Bonfire Grill which closed in February. The owners, who also run popular wine bar Jack & Nellie’s on nearby Ascan Avenue, said they are planning to renovate the entire space for their next venture. “We are gutting it completely,” said Eve Gagnon, 34, who's currently a waitress and manager at Jack & Nellie's. She teamed up with Cyril Burke, 48, the owner of the wine bar, to open the new restaurant. “We want to give it its own facelift,” she said. Rove is intended to be a neighborhood place with a “rustic” feel, the owners said. The menu is still in the works, but the owners noted that it will be an "eclectic" combination of various cuisines, including comfort foods that will reflect the owners' backgrounds to some degree, they said. Gagnon is French and Chinese, Burke is Irish and the executive chef, currently working at Jack & Nellie's, is Ecuadorian, they said. Several dishes served over the years at the wine bar will also be offered at the new eatery, but in general, Rove “is not going be a sister of Jack and Nellie’s,” they said. “It’s its own entity,” Gagnon said. Rove, which will be open from noon to 2 a.m. (4 a.m. on weekends) will also offer wines and beers from local breweries and wineries and will serve brunch on weekends. The name of the eatery was inspired by the way locals and visitors tend to wander into the neighborhood for its bars and concerts, Gagnon said. “People are kind of just roving around and need a place to sit down and have a bite or have a drink," she said. "They stop, they look at our menu and they come in or they don’t come in." “We love that about this community," she continued.